For the last couple years, some in the wireless industry have been pushing for providers of data-heavy content to subsidize users’ wireless plans in order to guarantee that subscribers don’t hit their monthly usage caps. Apparently, ESPN is mulling over whether it wants to go that route, but we really hope they don’t. According to the Wall Street Journal, ESPN has already talked to at least one major wireless company about a subsidy that would pay the carrier additional money to guarantee that ESPN mobile content would not count against a subscriber’s monthly data plan. The Journal’s sources caution that this has just been a discussion and nothing may come out of it. Aside from cost and possible regulatory considerations, ESPN would need to consider the industry-wide ramifications of such a deal. 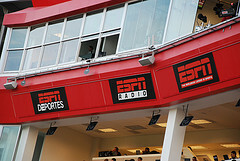 Additionally, many consumers actually stream video to their wireless devices over a wifi connection, rather than the wireless company’s 3G or 4G setup, so ESPN would be paying money for customers who aren’t in any danger of reaching their monthly data cap. In 2012, the average mobile phone user was only using about 659 MB of data per month, only about 1/3 of a standard 2GB/month smartphone plan. Another question is: Why should content providers be penalized for creating something people want? A popular website or streaming service is already paying a large amount of money on its own back-end to store and serve that content. If a wireless carrier wants to attract customers by advertising that “You can watch ESPN games on your new AT&T/Verizon/Whatever phone,” then it should know that desirable content will create increased demands on its network. If content providers do begin subsidizing wireless plans, then consumers should demand lower monthly rates — or the elimination of data caps entirely, as that extra cost will be borne by ESPN and others. Of course, we all know that will never happen. Those of us who are old enough to remember when cable TV channels first started airing commercials know this all too well. Would You Ditch ESPN To Shave $8/Month Off Your Cable Bill?